What an amazingly flavorful combination this experiment was! So when I told my family we’re having fried chicken sandwiches with spicy blueberry sauce, well, most of them thought, once again, she’s pushing it. But my oldest son and I couldn’t wait to try this combination. Purely experimental yet worked so so well. It may be my new favorite sandwich. The blueberry sauce spiked with sriratcha over the crispy fried chicken on a toasted bun made me crave more messy bites when it was gone. Messy is good. 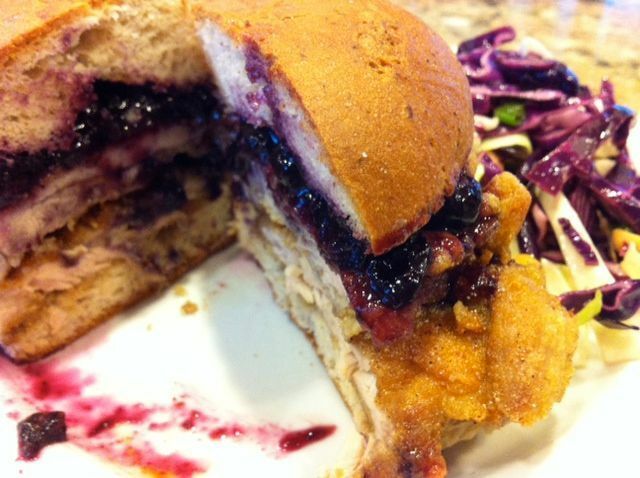 I also prepared a cabbage slaw with peanuts in a red wine vinaigrette which was really good, but sorry cabbage slaw, the blueberry sauced chicken sandwich stole the show! Fried is not the healthiest option but you need to live a little, right?! Besides all those antioxidants in the blueberries and the cabbage will make up for it (well maybe add a good sweat session the next morning too). Put away your mayo, and ketchup, and dig into this savory recipe. Let me know how you like this flavor combination…kinda think you will. Enjoy! First clean off any excess fat off the chicken. Season chicken evenly with kosher salt. I use a lined baking sheet to spread all the chicken out so I can evenly season, then turn over every piece to season the other side. In a medium bowl, combine eggs and coconut milk, whisk well. In another bowl combine flours, sweet paprika, and garlic. Then, in a two-part process, dunk the chicken into the egg mixture. Transfer to the flour mixture, coat both sides well.Heat a heavy bottomed skillet on medium high heat, heat oil (it will be ready when a drop of flour sizzles, about 2 minutes). Cook chicken about 5 minutes on each side. 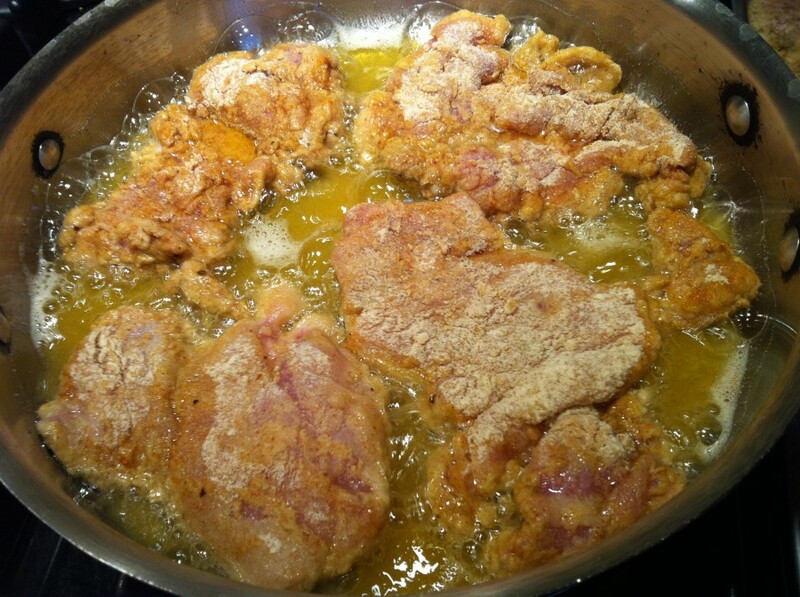 Leave some space around each piece so that the oil does not steam, or it will become soggy. Use more oil if needed.Once cooked, transfer to a plate with paper towels or a cooling rack with a sheet pan under it. 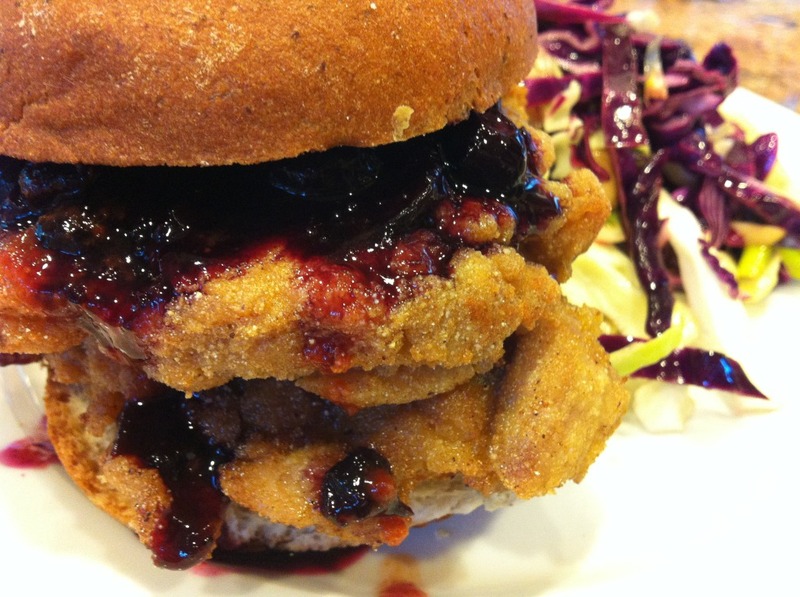 Serve hot on hamburger buns with a heaping spoon of spicy blueberry sauce. *Please Note: To avoid cross contamination, wash hands every time you come in contact with raw chicken. I use latex free kitchen gloves to season and coat the season then discard. I also use different tongs for handling meat and for cooking. If someone were to tell me that blueberry sauce on fried chicken would be delicious I would have told them they have a vivid imagination and you must be joking. Well I saw the picture on this post and I thought maybe it's not so crazy after all. I followed all your steps exactly as you described (thank you Jessica for being so detailed) and the result was the most amazing dish! It was love at first bite. My family enjoyed the chicken so much and we're looking forward to trying your other dishes. Gluten free and amazing taste ... what a combination! Thank you for sharing. I thought to give this a try since pinterest got me curious enough to taste it. What an awesome sandwich! I followed your frying method to crispy chicken success and that sauce...seriously one of my favorite sandwiches all summer! Can't wait to try the green enchiladas next! Aw thanks Jackie, I'm super happy you loved the recipe and the frying method can be used for all kind of frying-veggies, fish, calamari, everything! P.S.-You will love how light the enchiladas are in addition to all the flavors...enjoy!